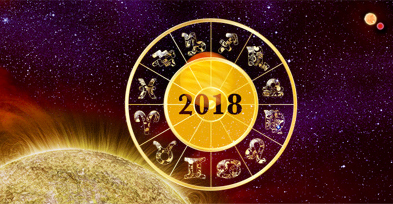 Looking at the Aquarius 2018 horoscope, it appears that you are going to enjoy some great success this year. You should leave behind the busy and chaotic times of 2016 & 17. This is the year when you reap the benefit of all the hard work done by you in the past. Gains and growth would go hand in hand and appreciation of your efforts would be there. Luck appears to be favouring and you can expect good results from foreign and overseas ventures. This means that travelling could hold the key to success this year. Finance is one area that is likely to experience maximum growth. Your efforts might earn you some accolades and awards this year. With the ability to strike the right business chords at the most unexpected of the places, this year you seem to have a �Midas touch�. This ability of yours may result in more profits and gains. People would get impressed and even appreciate your dedication towards work. Religion also appears to be holding a special place in your life during 2018. The year 2018 appears to be satisfying for you where you will be contented with life�s gifts. Career & professional front appears to be busy and high on energy as indicated by Aquarius 2018 forecast. The mantra to succeed this year should be to focus on bettering the projects that you have invested in the past. The efforts made over the last six months should work as foundation of future ventures rather than chasing new customers, business ideas or investing in new projects. This option offers consistent growth while new projects & ventures might look exciting but lack the prospects of gains. The period denotes the time for some quick gains. You may see yourself traveling away from home which should create some great avenues of growth & profits. Foreign connections & partners should contribute towards the betterment of your progress. Work appears a bit like a political field this year. An eventful year could be expected with a tussle for power. The key to succeed out of this kind of situation is to be diplomatic and move in a planned way. Wise decision making is the right way for you and your colleagues at work to overcome hurdles. Be smart & alert at work as your seniors may play their tricks. 2018 is not favourable to make new investments or take any financial risks. If you take any unplanned decisions then you might face some major financial crisis during July & August 2018. Being a little old fashioned is the need of the hour when it comes to finances between June & September 2018. Try to stay away from rumours and gossips this year. Aquarius 2018 predictions denote a blissful phase in love and marriage. A new relationship might complicate your life to some extent. The reason for this could be the low level of understanding or some sort of unconventionality. You may even see yourself getting involved in an extra marital affair. The period from 8th October to 17th November 2018 could be termed as eventful, exciting & passionate. There could be some compatibility issues between you and your spouse/partner during May & September 2018. This might lead to some disturbance between the two. Aquarius, 2018 promises to be a rather successful year for you. Simple, subtle and good natured should be the way to be at home & work for achieving excellent results. Your positive temperament and right attitude should promote major growth during 2018. It would be a balanced month. Wealth and financial status would be stable. Fewer financial gains appear this month. Traveling for government work is possible. Some minor losses are predicted. Overall prosperity would be there. This month may demand a lot of efforts. Financial gains appear to stay away from you. Health appears to be an area of concern. Personality and charm will remain average this month. It is advised to manage your money and assets well this month. Things would slowly improve in this month. Good things should happen with accumulation of wealth. Money should flow from different sources. Robust personality and magnetism would give financial status a boost. Cash money would go up due to better earning capacity. With better health you will also achieve much name & fame. Strong financial status & prosperity is predicted. Wise decisions would be appreciated by all. With promising sources of income, this is a good month to make material achievements and purchasing expensive things. Short pilgrimage looks to be on the card along with significant push in honor and esteem at workplace. You may see yourself taking wise and enthusiastic decisions. A promotion in job is possible and you may also develop good leadership qualities. Your authoritative at work remains undisturbed. A rise in reputation doesn't look far. Good prospects of gaining respect and fame. Your social activities would increase but progeny prospects are not bright. Success in new endeavours is denoted. This is the bright sign in your career. You are likely to get benefits in job. Health would be an area of concern and might lead to heavy expenditures. Stay away from litigation as this might turn out to be too expensive for you. You may have to compete a lot this month. Don't overexert your body and take proper rest. Financial gains are there via business associates. Trade and business may expand with considerable profits. Your spouse appears to be making progress. Financial profits from Work partners & business travel is predicted. Minor disappointments but major growth is denoted in the area of work. Manage your savings and finances this month. Fortune is likely to rise with luck mostly in your favour. Cash flow would be steady despite some restrictions. Spiritual learning & religious inclination lead to pilgrimages. You might initiate some new tings this month. Fortune seems to be in your favour. Financial front would be strong. You would posses robust courage, ego, & intelligence. Your public esteem will rise but assets and education remain areas of concern this month.